Paula's Choice Resist Intensive Wrinkle-Repair Retinol Serum is an exclusive formula that utilizes a proprietary blend of highly stabilized Retinol, potent antioxidants, and skin-repairing ingredients. Its soothing, silky texture goes to work immediately to help skin of any age look and act younger. With ongoing use, you will see fewer wrinkles, smoother skin, and improved skin tone. Formula is colorant and fragrance free. Apply in the evening after cleansing, toning, and exfoliating. Smooth a few drops onto skin before or after moisturizing. Perfect for use around the eyes. Cyclopentasiloxane, Dimethiconol, Neopentyl Glycol Diheptanoate, Dicaprylyl Carbonate, Caprylic/Capric Triglyceride, Phenyl Trimethicone, Squalane, Bisabolol, Tetrahexyldecyl Ascorbate, Retinol, Tocotrienols, Tocopherol, Lecithin, Laminaria Ochroleuca (Kelp) Extract, Avena Sativa (Oat) Kernel Oil, Elaeis Guineensis (Palm) Oil, Stearyl Glycyrrhetinate, Hexylene Glycol, Caprylyl Glycol, Ethylhexylglycerin, Phenoxyethanol. 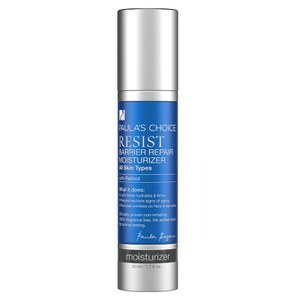 I purchased the trial size of the PAULA'S CHOICE RESIST INTENSIVE WRINKLE-REPAIR RETINOL SERUM, and loved it! The trial size lasted me a few weeks. During that time I noticed my skin looked and felt smoother and my fine lines seemed to be less noticeable. My skin is very sensitive, but Paula's products never cause me any irritation or nasty side effects. I ordered the standard sized product today and would highly recommend this product to a friend.